John W. Leavitt was born in Ogden, Utah, December 4, 1870. He was the first son of John Quincy Leavitt and Cynthia Tryphenia Elmer Leavitt. He attended school in Ogden for a short time until the family moved to Farmington, Utah where his father helped build the Union Pacific railroad from Ogden to Salt Lake City. Utah. John became a railroad man when he was about 18 years old and worked from Ogden Hot Springs to Ogden, Utah. At this time his father leased the Ogden Hot Springs - Ogden Utah branch line. He also helped build the Utah Central Railroad. Here is a link to the 50 year Utah Central Railroad Jubilee Program, which lists him as one of the individuals that helped build the railroad. When they moved to Salt Lake City, Utah, he met George Albert Smith, who later became one of the President's of the L. D. S. Church. They became very close friends and played marbles together in their younger years. When they were in their teens, they played pool together quite frequently and became good enough to earn their own spending money. John became an expert pool player, so his brother Elmer Uncle EI, set up a game with a professional pool player: who had come to town to play for money. This man challenged anyone to a game, so EI made arrangements for John to meet him in the Wellington Hotel lobby near the Union Pacific Depot in Salt Lake City. John really didn't want to play against the professional, but his brother EI convinced him to give it a try. By the time they arrived at the Wellington Hotel, a crowd had gathered to watch the match. After seeing the crowd, John wanted to call it off again, but his brother EI told him he couldn't forfeit the game because there were too many people betting on him. As luck would have it, John won the game, pleasing everyone, but ironically he never played professionally again. 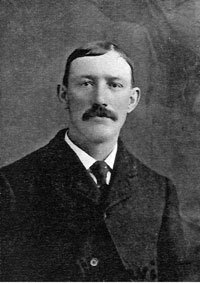 He met Mary Jane Ollerton in Sterling, Utah where they were married in a double wedding ceremony with Jane's sister Alfretta, Aunt Ret, in Sterling, Utah, October 26, 1892. They moved to Ogden, Utah soon after they were married where Myrtle Dell, their first daughter, was born on November 30, 1893. From there, they then moved to Salt Lake City, Utah where their second child and first son, Gerald Ward Leavitt was born on January 4, 1896 the year Utah became a state. December 2, 1898, Clyde Elmer Leavitt was born and during the same year the family moved to Juab, Utah. Three years later while on a short trip to visit Jane's sister in LeVan, Utah, Claire Leavitt was born February 14, 1901. Mildred Leavitt was born in Juab, August 12, 1903 and during this year, the family moved back to Salt Lake City, Utah where John Seth Leavitt was born on December 2, 1906. Salt Lake City became their permanent home. Three years later, When Mildred was just 6 years old, she passed away. The same year, Lyman Ollerton Leavitt was born on July 5, 1909. Later on, two more children were added to the Leavitt family. Dorothy LaVern Leavitt, born August 6, 1911 and Dean Quincy Leavitt born January 13, 1915. While John was an engineer, he was involved in a terrible train wreck that damaged his left hip and leg resulting in a permanent handicap. This accident happened on September 9, 1909, between Boulder and Tintic, Utah when two freight trains had a head-on-collision. John couldn't work for nearly two years, so while recuperating from his accident his brother Julian showed him how to make Oyster Cocktails for the various saloons in Salt Lake City. Jane and John worked on these at home and Julian delivered them to the saloons. When John regained his health, he returned to the railroad for several more years until 1929, when he had to retire because of his disability. John had many hobbies, but loved fishing and hunting the most and spent a good deal of time at this sport. He also enjoyed company and frequently loved to have party's in his home. Love of good music was another characteristic of John who, when a young boy, played the guitar quite well and enjoyed performing for the family. John and Jane had good neighbors and became very close to them as the years went on. They were like part of the family because they often helped one another in time of need. They made their own fun and therefore, played cards with the neighbors three and four times a week. John Leavitt was a man of respect and he was stern in his beliefs. John was not an active member in the L. D. S. Church but he believed in the religion sincerely. He was a very quiet man and seldom did he ever show his anger and, of course, his first love was his home and his family. He insisted on obedience in raising his family and as a result great admiration was held for the man by his children. John was known for his kindness to other people. Much of his lifetime was devoted to helping people, by often times having them live with his own family in times of need. John W. Leavitt passed away on July 8, 1948 and was buried in the Salt Lake Cemetery.